It’s always been my theory that every handheld needs a great puzzle game in order to be a success. The Game Boy naturally had Tetris (and, to a lesser extent, the GBC had Tetris DX), the Game Gear had Columns, and it could even be argued that most of the best games so far on the DS have essentially been expanded puzzle games. Look at the long list of those who have fallen to the might of the Game Boy and they’re all lacking that one classic puzzler. The home console ports and games that show off the latest handheld technology are one thing, but it’s the simple but addictive puzzler that keeps people coming back time and again as the fads of the moment wear off and they go looking for the next big thing. I can say without a shadow of a doubt that Lumines is that puzzle game for the PSP. Like the best of them it’s a falling block puzzle at heart. Blocks made up of four smaller squares fall from the top of the screen, and when you arrange four squares of the same colour into a block they wait to be wiped out by the line that’s interminably scrolling across the screen. When they disappear the blocks above fall, hopefully creating combos and point multipliers for you. The occasional special block will fall, with luck creating a mass combo when wiped out by taking all connected blocks of the same colour with it, but that’s pretty much the only complication thrown into the mix. Simple, but all the best ones are. The formula has added depth, as it’s possible to use the timing of the timeline to maximise the combos that you can set up – hold off dropping the block until it passes to give you more time to add squares to the potential combo, or even drop a block so that the squares matching up with a potential block in the middle of the screen coincides with the passing timeline, getting rid of squares from the middle of the screen. It sounds complicated but all of these little tricks make themselves obvious through playing the game, naturally emerging as you get better at it. Ultimately Lumines is still a block puzzle (albeit an extremely good one), and the hook that makes it different from the numerous others is where Tetsuya Mizuguchi has obviously been inspired by his underappreciated Dreamcast/PS2 shooter, Rez. Music is one of the key elements of the game, probably even more important that the graphics, as your actions create sounds which blend with the music (the game has different music on each “skin”, but it mostly follows a dance/trance theme), and then the music and visuals change almost imperceptably based on your performance. It all comes together into a seamless audio/video experience that leaves you unable to help being drawn into the game. Believe me, hours have passed without me noticing when I’m playing. It’s dangerously effective as a time waster. For me at least, the ultimate benchmark for a puzzle game is how it stands up against Tetris DX which is, in my opinion, the defining example of the genre. In that comparison I can’t say that I’d abandon my GBA SP and battered old Tetris DX cart, but this is probably the closest anyone has come. 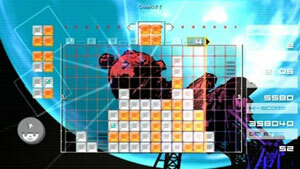 Lumines is an absolutely sterling game that does everything right – simple premise, advanced techniques and tactics to learn and improve scores as you play more, and an almost hypnotic visual style that makes good use of the minimal hardware demands of a puzzle game. It gives Tetris a good run for its money and, on its own merits, is one of the best pure gameplay experiences that I’ve played in a long time.